Your doctor's surgery, local police station, care centre or railway - they're all your public services. But right now, they can be privatised or outsourced, and run by companies that don't have to tell you anything. What about your rights? You don't have any. Let's change that with a Public Service Users Bill to give you a say. (The Bill has already been supported by 102 MPs in Early Day Motion 438 and put forward as a Private Members Bill in parliament.) The infographic below shows what this new legislation would do for you. 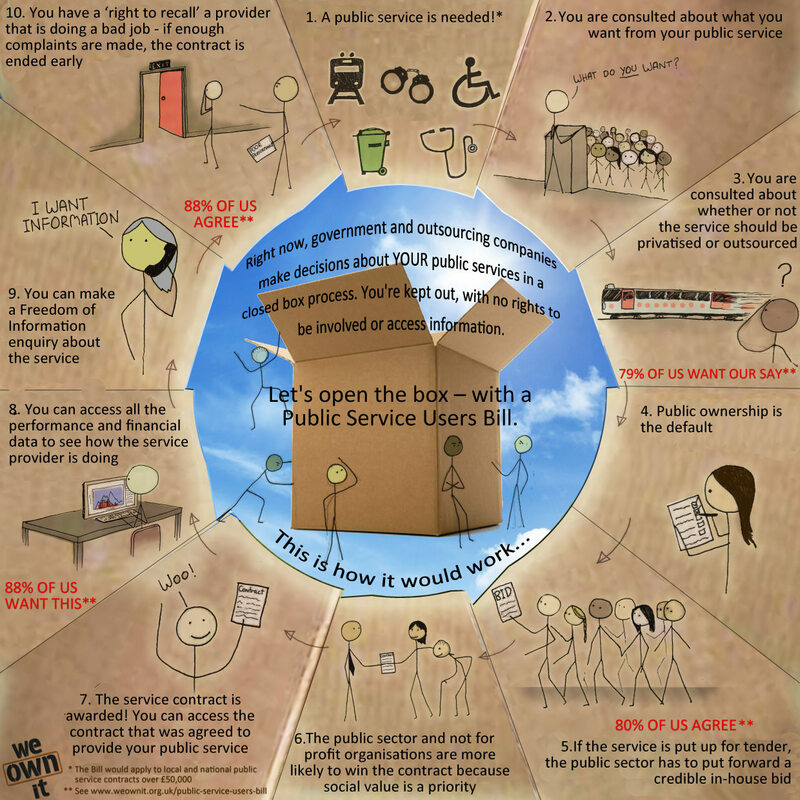 You would be consulted before any public service is privatised or outsourced (supported by 79% of the public). You would be consulted in general about the services you receive through public service contracts. Local or national government would have to thoroughly consider public ownership before contracting out (supported by 60% of the public). If the service is put out to tender, there would always be a realistic, thorough in-house bid from the public sector (supported by 80% of the public). Organisations that are focussed on meeting your needs rather than making a profit – the public sector and cooperatives, genuine mutuals, charities and social enterprises – would be more likely to win contracts (supported by 57% of the public). You would be able to see performance and financial data from the private companies running your public services - they would be as transparent as the public sector (supported by 88% of the public). You could make Freedom Of Information requests to private companies running public services (48% of the public mistakenly believe this is already the case). You would have a ‘right to recall’ private companies who are doing a bad job (supported by 88% of the public). Read more - our report 'Better in public hands' shows why you must have a say when it comes to how your public services are run. Photo used under Creative Commons licensing, thanks to Mel B.